It’s hard to think that the web-encompassing art of SEO has only existed in a form that faintly resembles what we know it as today for just under 20 years. It’s an attention seeking behemoth of the digital age that has become so intricate that you can find millions of pages of information online promising offering tips, tricks and mastery of the world of SEO – it’s also managed to make a few marketing gurus into millionaires along the way. So what does the future hold for SEO? Can its influence be sustained in the ever-evolving, ever-fickle digital age? Could anything rise up and replace it? The future of Search Engine Optimisation, as with virtually anything that exists online, is an uncertain one. And today there are more threats to its effectiveness than ever before. Here are four hurdles that SEO needs to overcome to stay at the pinnacle of digital marketing. Much of SEO today must adhere to the whims of Google. The market leader in search engines, for the last ten years or so, has held all the cards when it comes to optimisation. This means that when Google changes anything in its algorithms or processes, SEO experts have to adapt quickly – the fear is that one day the search giant will develop in a way that forces Search Engine Optimisation into redundancy. Furthermore, it could be the case that this process has already begun and that SEO has already embarked on a slow path to irrelevance. The above picture shows a fairly typical search for The Beatles. But take a look at the format of the search results. Visible above the fold is just two search results – one being the band’s official website, and the other being their Wikipedia entry (you’d need one hell of a good SEO strategy to appear above either, incidentally). And, that’s considering the fact that there’re also no paid ads. 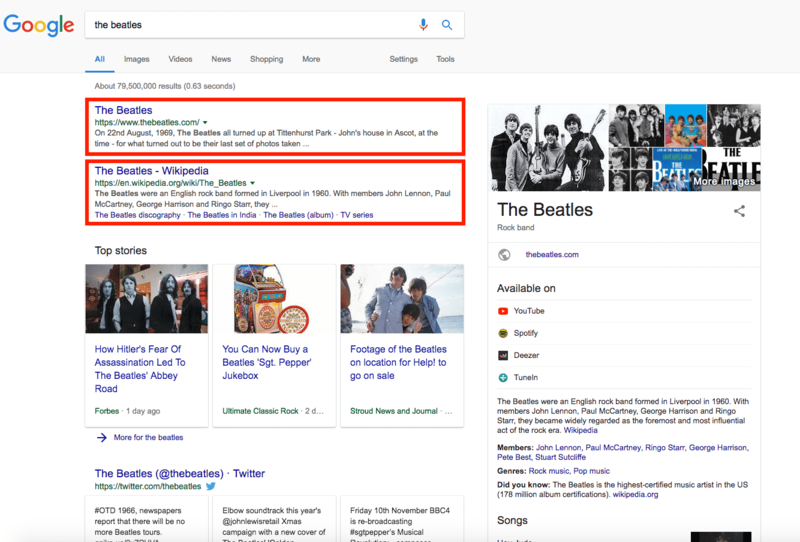 Instead of the old-fashioned list format that ranks search results in descending order of relevance, we now have large graphical excerpts from The Beatles Wikipedia entry, their official Twitter feed, and news stories regarding the band. This immediately throws any SEO infused homages to John, Paul, George and Ringo out of what can be seen on a browser in favour of content that can’t be affected by optimisation nearly as easily. So what can SEOs do to get around this significant loss of prominence? If Google is insistent on producing superfluous social media and breaking news stories on a general page, then it’s worth getting more specific. 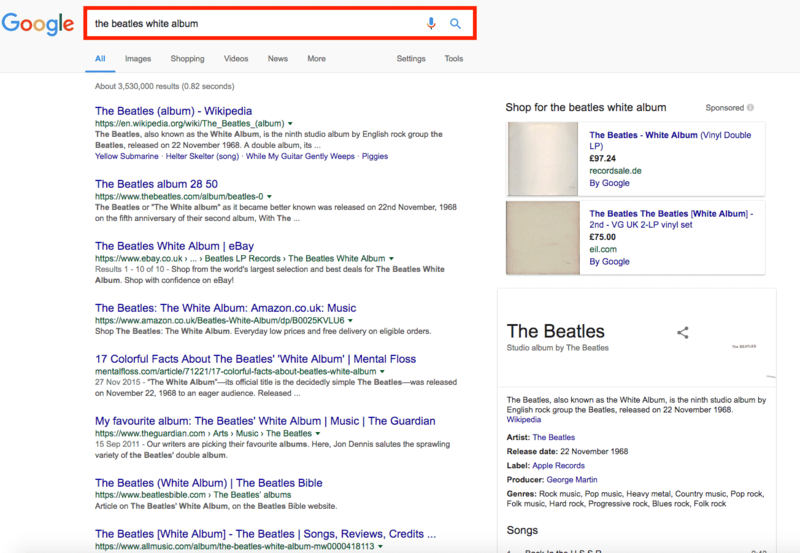 Here, by making the more explicit mention of The Beatles’ White Album, we rediscover the traditional reel of results that SEOs love to see. Of course, by using more distinctive keywords, it may risk narrowing the searches that will display your content – but if utilised correctly it can work wonders in gaining fresh exposure for your site’s articles. This was one of the first warning signs that Google has had enough of us. 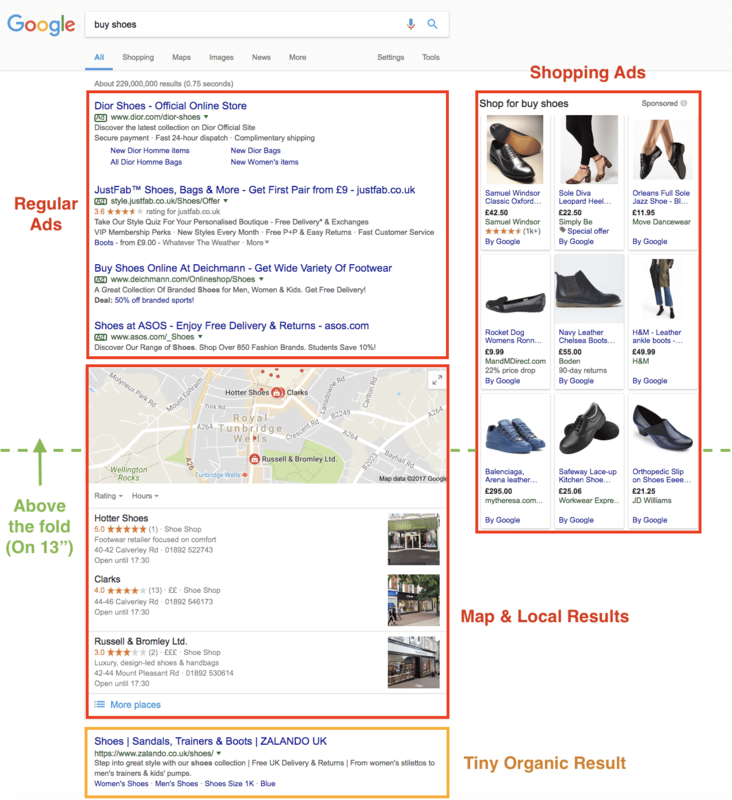 Featured adverts have been displayed at the very top of the search engine giant’s results pages for many years now, and once again it works by stealing the prominence of the relevant search results. Here, a simple search for ‘buy shoes’ triggers Google into action. It’s not only recognised my general location, but offered me four registered adverts and nine ads in their shopping suggestions sidebar in the visible space above the fold. The first organic listing doesn’t appear until you scroll way down (what you’d usually do to go to the next page). Google’s reliance on promoting their paid results as opposed to organic ones has huge negative connotations for SEO, which is all about gaining prominence and visibility – if adverts take that visibility away, then SEOs are suffocated. What’s even more problematic is if the featured advertisements succeed in enticing searchers into visiting and purchasing products from their online store, then the chances are that the customer may stop searching altogether – and develop a reliance on the first shop that’s been displayed to them. Again, to counter this, if your product has a niche then exploit it – in this instance, you’re fighting to keep your head above the murky depths of the latter pages of Google’s rankings, and the more keyword-specific you can be, the better. Amazon’s Echo, Google Home, and Sonos One are all heralded as the future of technology – voice-controlled smart speakers that can do anything from telling you what the weather’s like in London (it’s probably raining), to playing your favourite song from your wild-child days as a college kid. And that’s all well and good, but when using them as search engines, instead of being presented with thousands of pages of results, you get only one result, most popular answer to your query – this is bad news for SEOs everywhere, although there’s still a way to optimise your site for voice queries. All this time the emphasis has been on appeasing the mystic rhythms and algorithms of our Google overlords, but what about the emerging world that operates away from the traditional form of the search giant? Non-Google threats to SEO come in many guises, some have been around for nearly a generation, while others have been reinvented in a way that’s become problematic. Wikipedia, for example, is a wonder of the digital age – a crowd-sourced encyclopedia that envelops the internet. When you need to learn about something, Wikipedia tends to be the first port of call for an overview. While on the other hand, Amazon and eBay draw in masses of people who know what they want and are keen to be presented with plenty of options before making a purchase. These pseudo-search engine oriented presences are now driving increasing numbers of users away from traditional forms of making queries online, and SEOs are finding it trickier to make their presence felt in these foreign avenues. 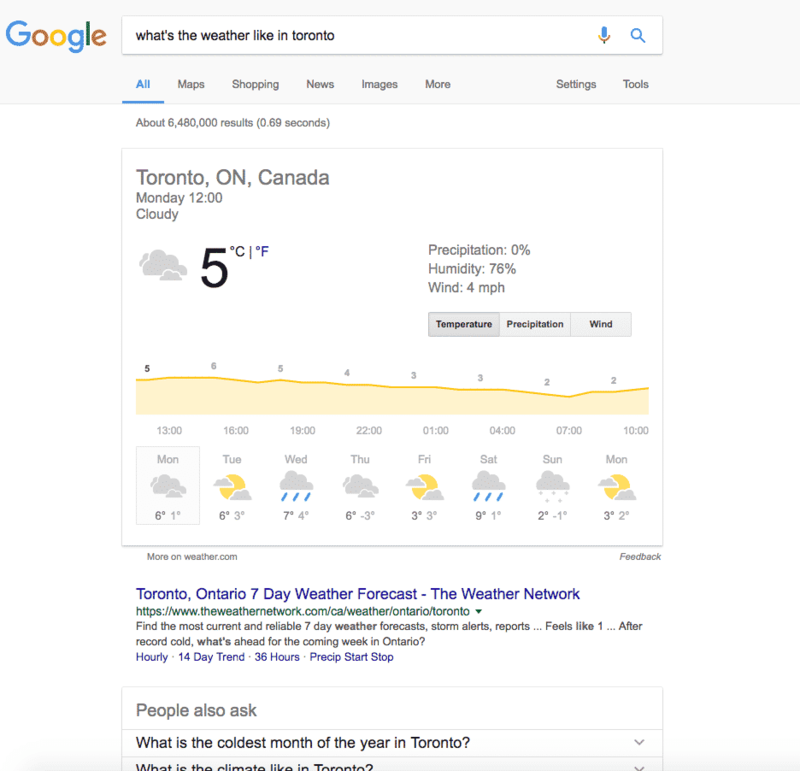 Luckily, the threats to Google’s dominance are currently less user-friendly than traditional search engines, and voice engines aren’t being used for nearly as many queries as the former at this stage – and likely won’t unless the technology advances further. For now, it’s worth optimising your presence on wherever brings your biggest traffic. If you have a service that lists products through Amazon, it’s best to aim for prominence there, while if your business has a Wikipedia page, then it’s best that you embrace it – especially now the online encyclopedia’s results are more prominently featured on Google. Future-proof your website by learning what makes your audience tick. By now you’re probably starting to wonder why Google ‘hates’ SEO so much, and it does seem like the search engine wants to wipe the art of forging prominence from the face of their pages. Here the worry is that Google may continue to develop its analytics to the point where it’s fully aware of what a website is and what it offers that it renders SEO redundant simply through becoming ‘sentient’ enough to avoid the lure of keywords, content & backlinks (this isn’t very likely to happen, but still – you can start panicking). This is what we call a ‘Knowledge Graph’. Not very knowledgeable in this particular case. Seems more like a nervous breakdown. Fortunately, Google knows that the link between their analysis and SEO is an intrinsic one – they need us nearly as much as we need them when it comes to understanding the internet and its own engine. So it’s likely that SEOs won’t be drowned out of work anytime soon by the burgeoning intuition of a search engine. At the end of the day, content and free information is their primary way of attracting users that eventually click on paid ads. Hence, make sure to invest time into optimising your content to move higher up in search results, be it with guest blogging, manual email outreach or consistent content production. So, in summary, yes – SEO faces a lot of obstacles to hurdle in remaining as effective as it’s always been. But 20 years is a lifetime in the digital age, and it’s continually evolved and adapted and ultimately lived to tell the tale. So don’t worry – you won’t need to raise the alarm just yet. Just keep on innovating! Dmytro is a Head Wizard at Solvid, a creative inbound marketing & software development agency in London, UK. His work has been featured and mentioned in a wide range of publication, including Kissmetrics, The Next Web, Business2Community, Huff Post, GoDaddy, Woorank, Smart Insights, Sitepoint, SEMRush, Backlinko, and more.